The West Palm Beach Police Department is investigating a hit and run fatality on Greenwood Avenue. The West Palm Beach Police Department is investigating a hit and run fatality which occurred shortly after midnight this morning (8/01/18). The victim was walking east to west along Greenwood Avenue, along the 5600 block when he fell. The suspect vehicle, possibly a 1998-1999 spruce silver metallic colored Toyota Avalon, was traveling south striking the pedestrian victim, and fleeing south on Greenwood Ave., and west on 45th Street. 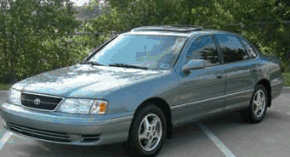 Suspect Vehicle: possibly 1998-1999 spruce silver metallic Toyota Avalon, tires extend outside the wheel well (fender underside); right fog lamp should be missing. Victim: 33-year-old adult male victim; next of kin has not been notified. ← The Palm Beach County Sheriff’s Office is seeking the public’s assistance identifying a suspect wanted for burglary to a residence.